When it was the turn of my old 103 with LCFM to be rebuilt for digital operation, I really wanted to experiment. Is it possible to use the old general-purpose stator with a 60902 decoder? Since this decoder was exclusively developed for use with DC motors, there is no black wire to connect to the stator, as used with Delta or c80. Other model railway enthusiasts reported of rebuilds where rotor and stator where connected in series. As visible in the photograph, I connected the 60902 decoder with the motor. My choice for diodes was the 1N5400. At first I did not connect the special functions and the lights, because I was mainly concerned about the running test. The result was disappointing. The locomotive did not start up at driving position 1, as all my other locomotives do, rather the motor just hummed. At driving position 2 it worked, but traveled much to fast. After I turned the speed down to level 1, the locomotive continued traveling at near even speed, but hardly slower than at level 2. The motor sounded very rough. Even though the potentiometer for speed was set to the minimum value, the locomotive was much too fast. 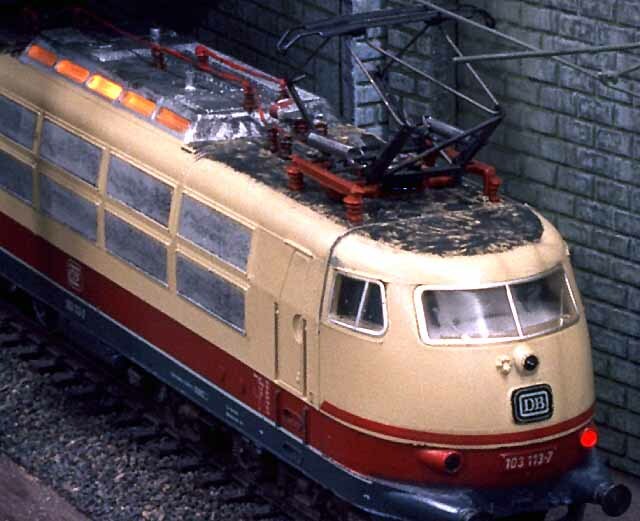 On downhill stretches, the 103 became faster, like other locomotives with a c80 or Delta decoder. Only towards the end of the descend, the decoder adjusted and slowed the locomotive down. The adjustment was however much to late. On inclines there was a big surprise the locomotive became faster! Only after the incline the locomotive continued at normal speed. Now it was time for a load test. Could the locomotive start up with a heavy train on an incline? It didn't, the motor just whined. Without a train it would start, but when stopped by hand, the motor would stop running immediately. Conclusion: This type of modification is only a stopgap. The locomotive will travel, but it is without power, travels much too fast and the controls do not work properly. To have a proper comparison, I installed the HAMO-Stator 22 05 60 into this locomotive and repeated the tests. The locomotive now started gently at driving position 1 and the motor sounded better. It was nowhere near as fast at higher speed levels and the speed remained stable on inclines / declines. Load tests on inclines were done without problems. It started easily at level 1 with a very heavy train. My other 103 with DCM, 5-pole rotor and an old 6090 decoder required at least speed level 2 for this train. When stopping the LCFM-103 by hand, the wheels started spinning. This old motor is very powerful. There was a problem when adjusting the 103, like all other locomotives, to travel 100km/h at speed level 10. Even with the potentiometer set to the minimum, the locomotive would travel at 138km/h. To increase the resistance, I swapped the copper brush with a second carbon brush. This brought a speed reduction to 125km/h, but that was not sufficient. An acquaintance suggested the use of a special LCFM-Rotor with the number 20 58 00 . 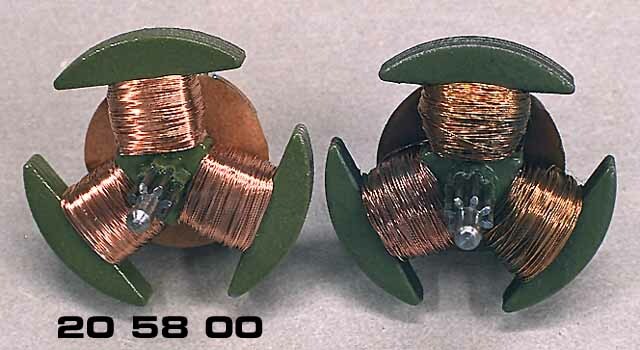 This rotor clearly has smaller windings, but shows the same resistance of 4.6 Ohm. Once I installed this rotor, the locomotive indeed traveled slower in one direction. With two carbon brushes it traveled at an ideal 99km/h, but in the other direction it moved at 129km/h, faster than before. In addition it sometimes jerked at level 5, when the control suddenly went to full speed. I also own a 103 (E03 002) with a new DCM and a 6090 decoder, but it is for no apparent reason rather weak on inclines. I swapped the two motors. As expected, my 103 113-7 with 60902 and DCM now performed without problems. Slow jerk-free travel and a lower top speed are as anticipated. 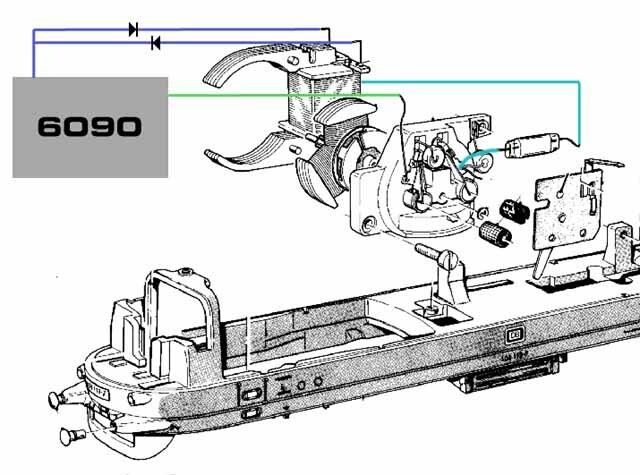 Now, what about the E03 002 with LCFM and 6090? A disaster! The locomotive is slightly too fast with 111km/h at level 10, but is unable to pull the slightest load. It requires speed level 4 to start on an incline with a train! By setting the potentiometer to the maximum there is more power available, but it travels faster than the "Transrapid" magnetic levitation train. At this time I can only operate this locomotive in "double-traction", using a E18 for assistance. This is, of course, not a proper solution, so next I tried the allegedly stronger double-magnet-stator 22 09 70 of the E 94 (3722). As I mounted the two 7558 magnets into the stator, I noticed that the magnetic field between the two arches (where the rotor was supposed to turn later), was no stronger than with the HAMO-stator. After completion of the alteration, there was no significant difference in the operating behavior and the locomotive was still too fast. I hoped, that due to the stronger magnetic field the EMK-feedback would be increased and thus influence the adjustments of the decoder. However, this was not the case. It actually appeared that the locomotive had less power than before and accordingly I installed a stronger 60902 decoder. This caused the locomotive to run even faster and thus I soldered a 4.7Ohm resistor into the power circuit for the motor. This did indeed slow the locomotive down somewhat, but with a corresponding loss of power. Last I tried a new rotor 20 58 00 with seven instead of eight teeth in the gear, hoping it would reduce the speed. Indeed, at speed level 10, the locomotive would only reach 91 km/h in one direction but would still run at 118 km/h in the other direction. On top of this it started to jerk at .5 second intervals after it had been run for some time at medium speeds. I have no idea why some of the LCFM changes such as the 216 work very well, while others such as the V100 do not work at all. The driving behavior of the 103 was more or less ok, apart from the excessive speed. In the future I shall change this locomotive to DCM, since only this change will ascertain reasonable load leveling. This will require a new suspension with the part number 40 66 40 and two screws 78 51 20. I feel that I now know the reason why Maerklin changed all the locomotives from xFCM to DCM. They likely had similar unpredict able results when they tried to make the old engines compatible with the c90. Many models of the series E03/103 are prepared from the factory for illumination of the port lights in the roof. Only the bulb sockets are missing. Actually, a plate with contact metal strips for bulbs should be riveted in this place. I enlarged the hole somewhat and inserted a new two-pole socket 60 41 80 and the suitable digital bulb 61 00 80. For brighter light, the 61 00 40 bulb will fit as well. The existing headlights and sockets, I also replaced with the new bulbs and two-pole sockets. 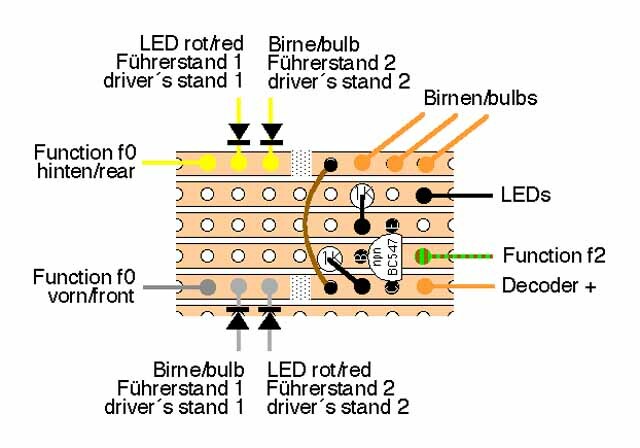 Since the bulbs now are no longer connected to the ground, it is possible to use the orange wire for flicker-free illumination. 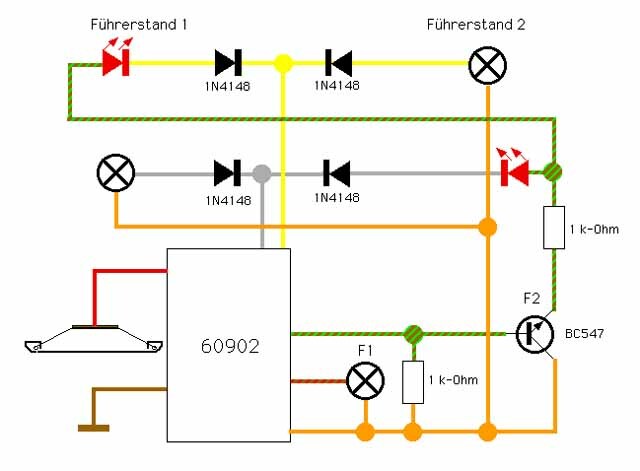 I connected the red-brown wire of the f1-function to the engine room bulb, so I can control it separately. For the f2-function I use a switching approach similar to the shuttle train locomotives BR 221 and BR 216.Since the BR103 is not equipped for shuttle train operation, it will hardly be found pushing a train. For this reason the triple headlights don't need to be turned off while the red taillight is on. Since the BR103 does not have taillights, they need to be installed. Instructions for this process are on page 4: BR 103 (3054). If the locomotive travels by itself, f2 remains turned off and the red taillight is on. The light function f0 also controls the taillights, depending on the travel direction. To save space I soldered everything onto a small circuit board. It is important to interrupt the conducting tracks in two places (shaded areas). Instead of the BC547's other npn-transistors in TO92 housing can be used as well, such as the BC239, BC338 or BC550. The small 1N4148 diodes will suffice but the regular 1N4001 will do as well. I mounted the 1 kilo Ohm resistors standing up. The resistors for the LED is mounted on the board as well, unlike the mounting used on the BR 216.